Winter is settling in and so is my stay-at-home-fever. One of my favorite indoor activities is to paint my nails. My friends & I do this a lot when we don’t feel like doing much and I think it’s fair to say that we enjoy it. Chatting about boys, gossiping about anything and everything while testing different manicures… Girl business at its best, you know! When The Body Shop sent me over some of their new colour crush nail polishes along with there new nail pen, I knew they’d take part in our girly get-togethers. The shades are great, the quality as well, but what truly blew my mind is that tiny little tool that makes it almost impossible to miss your nail art. 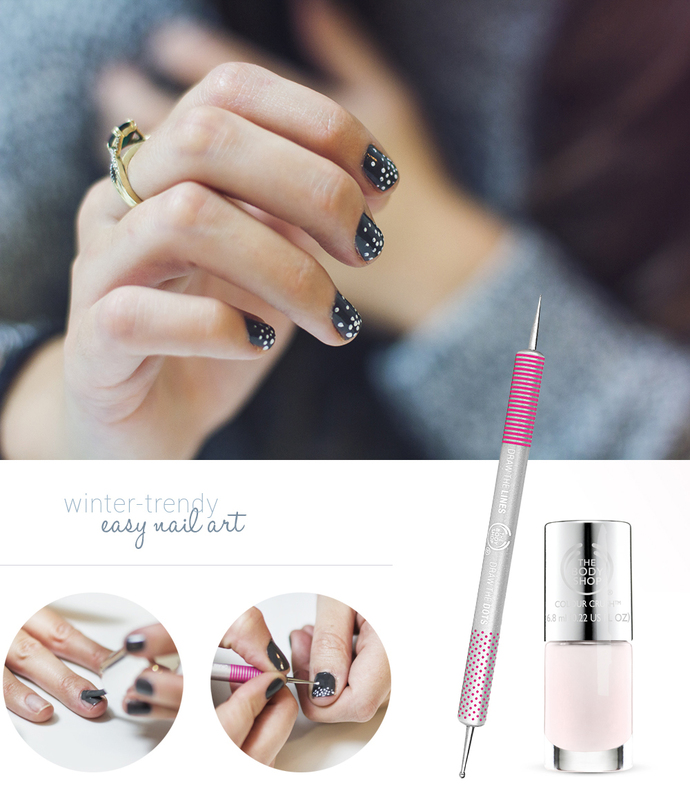 It’s a twin-tip metal tool that you can use with any nail polish to create details like dots or lines (as suggested on the tool itself). One of the manicures we ended up doing was inspired by the first snow day. It’s as easy as quick, and you won’t believe how useful this little tool is! How? You start by applying a first coat of nail polish. We chose 710 Big Smoke which is a charcoal grey. Let dry. When it’s completely dry, dip one tip of the tool (you decide if you prefer smaller dots or bigger) in a lighter shade of polish and paint small dots starting at the tip of the nail, just like little snowflake falling from the sky. TADA. You have it. The cutest winter-themed nails. I’m sure it looks as good in other color combination as well! Oh, and speaking about The Body Shop, have you guys seen their Black Friday deal? For only 30$ you can get a tote filled with 8 customer favorites (like the Shea Body Butter, the Strawberry Shower Gel, the Camomile Gentle Eye Makeup Remover and the Hemp Hand Protector…) with any 30$ purchase. It’s worth 120$ so that’s what I call a deal! Plus, there are others mix & match deals going on, so don’t miss out if you’re looking for awesome stocking stuffers or a little something to treat yourself ! Notify me of followup comments via e-mail. You can also <a href='http://coloursandbeyond.com/comment-subscriptions?srp=5754&srk=&sra=s&srsrc=f'>subscribe</a> without commenting.